If purchasing this seed mix, save or print this page and keep it as your reference. It is often said that wildflowers don't grow well on fertile top soil as they have to compete with tall rank grass that thrive on fertile top soil. This very colourful seed mixture can compete with the vigorous grasses, because all the species in this mixture are tall and or vigorous and they will out grow the grass and can be left un-cut until the end of summer. You will have to make a judgment as to when to cut, do not cut so late that it starts to 'lodge' or fall over. Always remove the cuttings to lower the fertility. Moisture Level: Not for soil that is very dry, suits normal, moist, but not flooded wet. Birdsfoot Trefoil, Black Meddick, Corn Marigold, Corn Poppy, Corncockle, Cornflower, Devil's bit, Field Scabious, Fleabane, Hemp Agrimony, Lesser Knapweed, Meadowsweet, Mullein, Ox-eye Daisy, Ragged Robin, Red Campion, Ribwort Plantain, Self heal, Scented Mayweed, Sorrel, St Johnswort, Wild Angelica, Wild Carrot, Yarrow, Yellow Agrimony. Foxglove is added as an extra, although it likes acid soil..
Sowing rate with grasses: 1.5 to 6 grams per metre depending on the percentage of grass. Provided the sward is kept open and a 'Thatch' is not allowed develop, species will continue to germinate and emerge, through to the third year. First Year: This mixture contains annuals, they will flower profusely, provided they are sown before June. They require one cut when finished flowering. Cut once in late August. If this mixture was not cut in first year, cut and remove foliage in early Spring. Cut again in July, August or September, depending on when flower finish or the level of weeds that emerge. In the third year, If the native grass seeds present in your soil germinate and grow, the meadow will require two or three cuts, the first cut in Spring (April/May) and the second cut in July or August, the meadow can again be cut in September if the grasses are still growing strong. In the fourth to fifth year, when the perennials in the mixture should be flowering on many stems and starting to clump and spread, again if the grass is still vigorous cut in spring and in August of the fourth year. However if the perennials are growing strong there will be no need to cut until July, August or September depending on the fertility and wetness of the soil and the species which have grown. Disposal of cut materials: Always remove the cuttings, wildflower meadow hay should be removed as soon as possible and not be heaped on site as it will grow mould (a health risk). Meadow cuttings can be spread as compost in sheet mulches around trees and shrubs or composted. Management: Control grasses and weeds until well established. Accept any weeds in first year as they provide cover, once the sward is established, digging, spot spraying or weed wiping can be used to eliminate problem species. 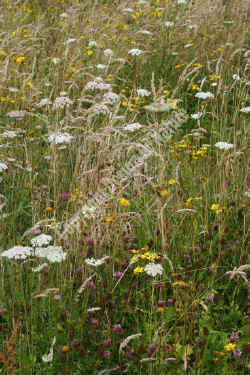 Control weeds, especially Creeping Buttercup, if Creeping Buttercup is present cut this meadow in May in year two. 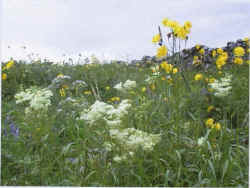 The third year is the critical year to maintain this meadow as scutch grass, creeping thistle, nettle and dock will try to dominate as the growing conditions are ideal for such unwanted species. Your purchase: Contributes to DBN's work of creating crops of Conservation Grade - Native Origin Wild flora. You help us to inform and pay land-owners to manage native species and to assist DBN in handing on our heritage for another generation.